Zurich/Paris. An athlete takes centre stage: The exciting racecar study WTCC Ultra will be the highlight of the Chevrolet Europe presentation at the Paris Motor Show from September 30 to October 15, 2006. The ready-to-drive concept car was developed by a GM team around the globe. 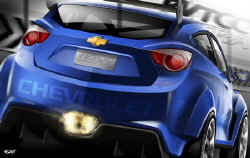 It is the optical vision of a new touring car generation and takes the Chevrolet body language to the extreme. The compact Chevrolet WTCC Ultra (length/width/height: 4,325/1,905/1,570 mm) will celebrate its world premiere on the Chevrolet stand in Hall 5.2 of the Expo in Paris. The trade and the general public will also get to see for the first time the new Chevrolet Epica Diesel, which will be launched in spring 2007. The mid-class sedan is powered by a two-litre common rail diesel with 150 hp. After the Captiva Diesel, which will reach the European showrooms in autumn and is celebrating its French premiere in Paris, the Epica is thus Chevrolet Europe's second diesel. The bold and aggressive design of the racecar study sounds out the limits of Chevrolet's design language. The WTCC Ultra is a design icon that bends the present WTCC regulations. Words like "aggressive, muscular and dramatic" describe the car's design. Sharp lines contrast with more organic, flowing surfaces. The WTCC Ultra is propelled by a 190 hp diesel engine. Its proportions give the impression of a car that looks fast even when it's standing still. Already much praised in the new Captiva, the up-to-date diesel engine from Chevrolet Europe is now to propel other model series, too: From spring 2007, the two-litre common rail unit will also be available for the midsize Epica sedan. The powerful diesel engine (rated output: 110kW/150 hp, max torque: 320 Nm at 2,000 rpm) is mated with a manual five-speed gearbox and can optionally also be paired with a five-speed automatic transmission. The Epica Diesel accelerates from 0-100 km/h in just 9.7 sec (automatic version: 10.1 sec) and has a top speed of 201 km/h (automatic: 208 km/h). Despite this excellent performance, the new powerplant is very frugal indeed with an expected MVEG fuel consumption of only 6.1 litres /100 km (automatic: 7.7 l/100 km). With its compact dimensions (length/width/height: 4,635/1,850/1,720 mm), strong, sporty design and comprehensive range of equipment even in the entry-level version, the Chevrolet Captiva is perfectly tailored to European customers. With this new crossover model, buyers have a choice between front-wheel and four-wheel drive, five and seven seats and a total of three engines, ranging from 136 to 230 hp.